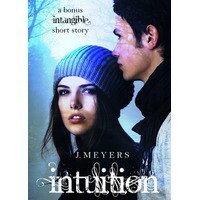 Before I started reading Intangible I looked into what other books J. Meyers had written and saw Intuition. It is free to purchase off Amazon and it is very much a prequel to Intangible. I actually read it after though because I didn't notice how short it was and wanted to be able to review Intangible as soon as possible. Even though this was only 51 pages it really gave you a sense of who Luke and Sera are as characters and what I loved even more is that the incident that happens within this book is referred to in Intangible which I didn't know at the time and was sat wondering why it got mentioned two or three times because I wasn't aware of the significance of it, d'oh! Completely my own fault for rushing into things head on though. Unlike Intangible I gave this four stars rather than five because it is more of a little back story to the Twins and not much happens but it was still lovely and worth reading. So if for whatever reason you're still unsure if you want to pick this series up then I recommend hopping over to download this to get a taste of Sera and Luke's lives.